I took both kids down to Ricoh Coliseum this afternoon to watch the Toronto Marlies take on the Grand Rapids Griffins. We won 5-4, extending our winning streak to three games. The more I'm exposed to this Marlies team, the more I like it. 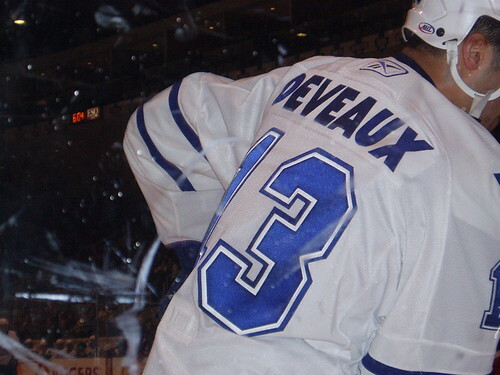 Then again, I'm a die-hard Leaf fan, and a great number of these Marlies have played with the Leafs. Here's a quick list, off the top of my head. Jeremy Williams opened the scoring, but all he ever does is score, Ryan Hollweg's stache looked massive from the first row, Bates Battaglia looked as sharp as ever and Jiri Tlusty should be a Leaf again any day now. Of all of Toronto's professional sports franchises, the Marlies are unique. They're actually going to play playoff games in 2009.